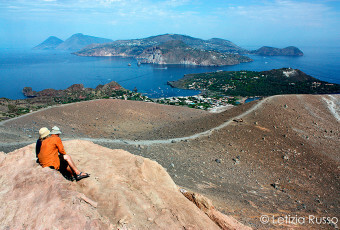 A small archipelago between Stromboli and Lipari, this is the way Panarea appears to be at the first sight: small islands and rocks which, emerging from the sea, give place to one of the most charming places of the whole Mediterranean. 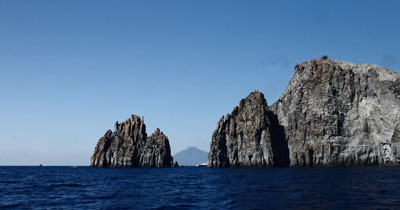 Panarea, together with isles and minor rocks, almost situated on the eastern side of the island, constitute a unique volcanic underwater complex. Between them Basiluzzo is the most charming, for two reasons: the first is to be found in its recent formation, which makes it one of the youngest craters of the Aeolians; the second ,in its dimensions which have permitted the agricultural use, or small settlements; situated at circa 2 miles to the north-east of Panarea, it extends upon the surface of 300 sq. m., representing the biggest uninhabited island of the Aeolian Islands. The volcanic origin of the place is already evident thanks to first observation of lava stratifications, which on the culminating point have reached the height of 169m upon the sea level. The island is principally constituted of rhyolite, a light-colour mineral which alternates with the black lucid colour of obsidian, and the white colour of pumice. The Basiluzzo formation dates back to 50,000 years ago, much more recent if compared to the near islands, and to Panarea, which formed between 150,000 and 300,000 years ago. The actual emerged portion of Basiluzzo is the remain of a volcanic neck, once much more extended, but now eroded by marine action and by bradyseismic phenomena, which create the soil’s lowering as the cause of emptying of magmatic chamber. The finds of Basiluzzo seem to confirm that the island, even if only for a simple visit, was frequented since the Neolithic Era; as a confirm of this thesis there are a lot of finds, amenable to the prehistoric village of Punta Milazzese in Panarea, on the southern side. Another important find, dating back to the Roman period, is that of a mosaic floor’s remains, and of coloured plasters, the remains of a villa probably built by a Roman owner, fallen in love with the place’s uniqueness. Adjacent to the villa they were found a covered barrel, used to gather waters, and a small boathouse, quite totally visible still today from 5m depth. Basiluzzo, during the last centuries, was frequented for an agricultural and a pasture purpose with its 3 hectares cultivated with cereals. This fact, at the end of the 17th century was the origin of a dispute between abusive farmers and the bishop of Lipari, the archipelago’s administer. Finally, in 1991, with the aim of preserving the ecosystem, an integral natural reserve, including all the other minor rocks, beyond the island, was established. On Basiluzzo there is only one natural landing on the very east point, from which an ancient path leads to an open space. Between the sharp rocks there are lush rosemary, and the lemons of the Aeolians. The flat part divided by dry walls, once used to grow the cereals, is today spontaneously invaded by heather, mastic, and common onion. Visiting Basiluzzo means to immerge into a unique atmosphere where the absolute silence is interrupted only by breaking of the waves against the coast, and by rustle of the wind. Once reached the peak it is possible to enjoy an amazing scenery of other rocks, and of Panarea; moreover, from this point you can fully appreciate the sharp morphology of this inhabited monolith. Basiluzzo continues giving emotions observing the coast, that is the reason why they advise those who have the possibility to totally circumnavigate it in order to observe the extraordinary coastal morphology, composed by small caves, high walls where lava stratifications and bizarre rocky formations, risen from the sea like monuments, are evident.